1937 Born on October 13 in Moscow, Russia - the second son of Stephane Grigorievich Grachev and Alexandra Kuzminichna Lobanova. Born in a village in the Tula province, Yuri’s parents received only primary education. During the 1920s, they moved to Moscow to escape from starvation. Yuri’s father began to work in a furniture factory and his mother was a seamstress and an expert knitter. 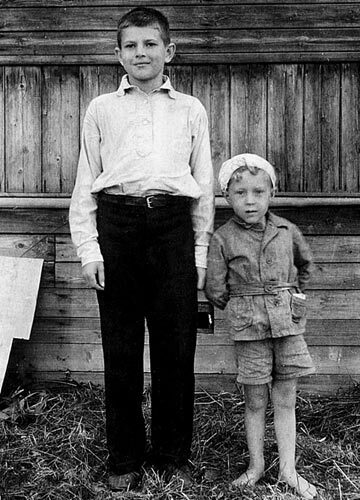 In 1923 their first son, Yuri’s brother, Eugene, was born. 1941 June 22. World War II began on the Russian front, where Yuri’s brother fought. At the end of that year, after having suffered several fractures, Yuri’s mother lost a leg above the knee to gangrene. 1943 Eugene Grachev, Yuri’s only brother, was killed at age 20 in a tank battle during a siege of Izium, a small Russian city near Kharkov. 1945 Yuri started first grade in elementary school No. 426 (Stalin region) in Izmailovo in Moscow. During his school years, he and his parents lived in a tiny room of a small wooden house, not far from school. The unsafe neighbourhood was known for its gangsters and violent crimes. 1950 Following entrance exams, Yuri was admitted to a specialized secondary Moscow Art School – a preparatory school for the State Surikov Institute of Art. The school was known for having maintained the demanding artistic traditions of the past. Several of Yuri’s teachers, such as Schorchev, Barsch and others, had been students of great Russian 19th century masters, including Korovin and Savitsky. Yuri became known early on among both his teachers and his peers for his drawing talent; his drawings were always singled out as exemplary. His drawing of Apollo Belvedere was hung in the school’s director’s office and put on the cover of Alexander Barsch’s book, “Drawing in the Moscow Art School”. 1953 On July 19 Yuri’s father died from stomach cancer at age 63. 1956 Graduated from the Moscow Art School, but was not admitted to the Surikov Institute. Entrance to this prestigious school was highly competitive and primarily reserved for the children of the elite. 1957 Entered Moscow Textile Institute, Faculty of Applied Arts. His teachers, Vasiliy Pochitalov (painting) and Vladimir Shugaev (composition), both recognized and supported Yuri’s talent and influenced his artistic development. Yuri valued their studies at the Institute enormously, for the knowledge he gained became the foundation both for his vision of art and for his future development as an artist. 1958 Married his first wife, fellow-student Eleonora Novikova; they divorced three years later. 1961 On January 16 Yuri’s mother died of heart failure at age 63. 1963 On January 7 received his diploma from the Moscow Textile Institute and began to work in a bureau for applied design, focusing on interior industrial design. He participated in the first group show in the Politechnical Museum in Moscow, exhibiting his black-and-white geometric compositions. During that year, Yuri married Elizabeth Drozdovskaya, who had been enrolled in the same department at the Moscow Textile Institute. 1964-1969 Taught drawing and painting at the Moscow Textile Institute. 1965 Daughter, Maria, was born on February 6. 1969-1976 Worked as an artist in an Industrial Complex of Applied Art in Moscow. Together with his wife, he made tapestries and theatre curtains commissioned by various state organizations. They began to exhibit their abstract-geometrical tapestries at annual shows in the Moscow Manezh Hall and at the House of Artists. Following a successful exhibit in 1970, Yuri and Elizabeth were both admitted into Moscow Union of Artists in the Department of Applied Arts. While a member of the Moscow Union of Artists, Yuri encouraged modernization in Soviet art and a move away from socialist realism toward freedom of artistic expression. He gained much respect and support among his colleagues and in Moscow artistic circles, and was a leader and active participant in various exhibitions held abroad, tin countries such as Hungary, Poland and India. Despite Yuri’s professional successes, all his achievements resulted from endless bureaucratic struggles with the Soviet system which drained his strength and creativity. His life was spent earning a living by making time-consuming hand-made tapestries commissioned by the State which required little artistic talent. Since he graduated from the Institute, Yuri had never been able to develop as a true artist and to draw with creative freedom. 1977 On August 11 emigrated from the Soviet Union with his wife Elizabeth and daughter Maria. The eight months the family spent in Rome waiting for a visa to the United States provided a great opportunity for Yuri to see the original masterpieces of the great Italian painters whose work he deeply admired, such as Leonardo da Vinci, Raphael, Boticelli, Perugino, as well as works by Rembrandt, Picasso and contemporary artists. Spurred on by his experiences in Italy, Yuri dedicated the rest of his life to drawing and painting, which he could never do in the Soviet Union.